Why Themify is better than any other WordPress themes? If you are a wordpress lover or looking to buy a new wordpress theme for your present website or blog, its a must read article before to buy a new theme. First of all, themify has all variety of themes and you never been disappointed with their collection. They have started building premium wordpress themes from year 2010 and till date themify had 43 professionally designed themes under their belt. All the Themify themes built using Themify builder (Drag & Drop Builder) which is constantly updating with new features and troubleshooting bugs as well. Most of the themes are ultra responsive (not all), faster loading, cross browser compatible, search engine friendly and compatible with latest wordpress version too. Themify refunds the subscription cost within 30 days, if you are did not like their service in any manner and also offers 1 extra premium theme as you wish when you purchase your preferred theme. Most of the market places, you never get refund if you are not satisfied with service or product. But themify does. 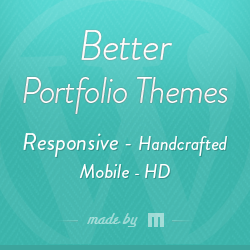 Have a look and test drive all WordPress themes before you buy.